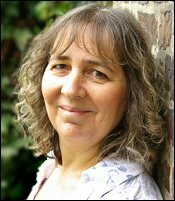 It was great to have Deborah Swift visit the blog on December 7, 2010, to talk about her debut novel The Lady's Slipper, about a seventeenth-century woman whose theft of a flower changes her life dramatically. Welcome, Deborah! Alice's shoes appear and disappear through the novel. Did you consciously set out to include these literal lady's slippers to echo the lady's slipper orchid, or did Alice's shoes appear on the page before you realized what you had done? The idea of using a woman's shoe arose naturally from the name of the flower, and I thought it would be interesting if another character could have a similar fascination for her lady's slippers (shoes) as Alice has for the orchid. For someone poorer, material comforts might be more important than the natural world, and I wanted a contrast of priorities. So yes, it was intended from the outset. In my first draft Ella the maid referred to the shoes as "slippers," but later I decided it would be a better reader experience if the readers made the link themselves and changed the wording to "shoes" except for a single reference. You write with great sympathy of your Quaker characters. Have you ever attended a Quaker meeting? I attended Quaker meetings as part of my research, but am not a regular attender. From my experiences there I admire the Quakers' lack of dogma, and their idea that each person must enquire for him/herself. Of course there are many different types of Quakers now, but they all have the silent meeting at their heart. I am also interested in why attending to silence - an absence, can make people re-assess what is meaningful. Are there circumstances under which you might, yourself, be tempted to steal a flower? On spring walks I am always tempted to come home with armfuls of bluebells or other wild flowers, but if everyone did that we would have no wild flowers left, so I refrain. Finding out so much about the fight to preserve our native species means I won't be tempted, besides - Alice's experience has put me off!